I mentioned in my distant but most recent post a desire to unleash some convoluted Bar-Kays rap family tree mixtape, with space allotted for the Bar Kays, Isaac Hayes, Ike Dirty, Gangsta Pat & Jazze Pha - all connected through musical & familial relations - and works related through sampling. But then Isaac Hayes' death became an inspiration to review more closely that life now lost. So in place of something with a larger scope is this mix of Hayes' most trampled breaks in both raw and sampled forms. 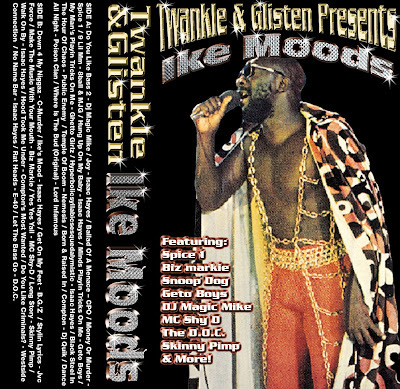 The fact that samples of Ike's work follow the full trajectory of rap history from the East Coast (Biz Markie, Ultramagnetic) to the West coast (NWA, CMW, Spice 1) to the Southern States (BG, Skinny Pimp) gives some clue as to the weight of his boots in rap annals. I hope this bootlegg cassette shows due respect in a way that only a bootlegg cassette can. RIP. Link is dead. Could there be a re-up of this historic collection?